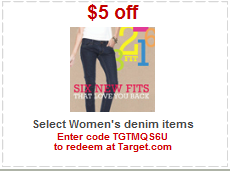 Target has a $5/1 coupon available for their entire stock of women’s denim! Print the coupon now and then keep your eye out for clearance bargains. Sometimes you can even get FREE items with these coupons.